This model is ideal for families with small gardens and a few fruit trees. Excalibur food dehydrator 4948CDFB contains nine large drying trays with a total area of 1,39 m2. 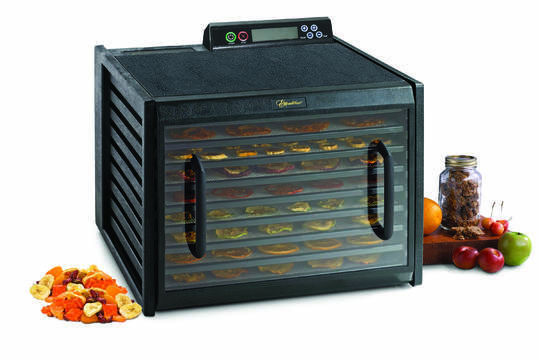 Dehydrator is equipped with a 13-cm fan, 600 Watt motor and adjustable thermostat. The case, doors and tray frame are made of very durable and strong polycarbonate, which does not break even under the wheels of a van or hammer blow. All components are manufactured and assembled in the United States unlike some faulty Chinese copies sold under various brands. Excalibur dehydrator 4948CDFB offers 26hours timer for added versatility. After the preset time period elapses, Excalibur will switch off automatically. In this way, you can easily adjust food drying to your daily schedule. Your Excalibur will switch off itself while you sleep or work. No more time-keeping, no more postponements because of other activities preventing you from supervising the drying process. 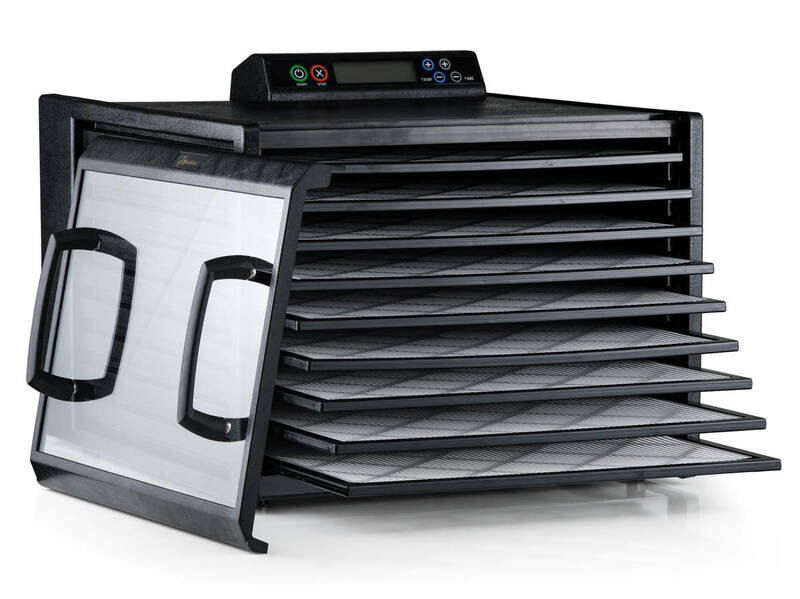 With the timer and in-built safety features, you can switch on the dehydrator and leave for a trip or go out for a nice dinner. The timer allows for drying without supervision. Removable trays let you customize drying space for small or large items which is impossible with stacking dehydrators. Bulky items get dry up to 10times faster than in common dehydrators. When drying liquids of mixed fruits and vegetables or yoghurts, you can cover the drying trays with Paraflexx non-stick sheets. Excellent value and great versatility. Dried fruits, vegetables or meat jerky are just the beginning! The Excalibur dehydrator is truly a multi-purpose device. Fruit, vegetable, flowers, bread, yoghurt making and many other goodies for which the use is easy and simple. 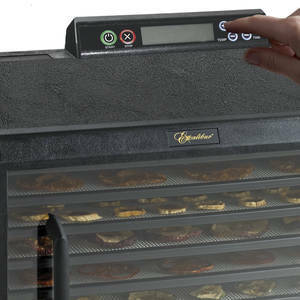 Horizontal airflow prevents flavour blending and allows for drying on all trays at once – with no rotation panel needed. 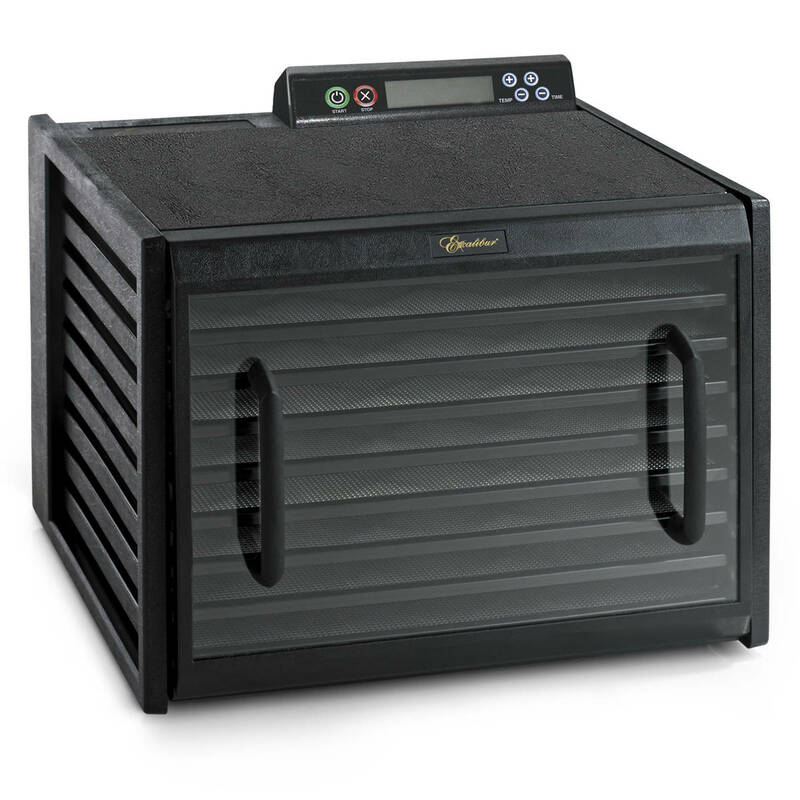 Reclining and removable doors save working space and allow for easy maintenance of the dehydrator. Adjustable thermostat allows precision drying. Dishwasher safe trays are equipped with removable sheets – handling and cleaning the trays is simple and easy. 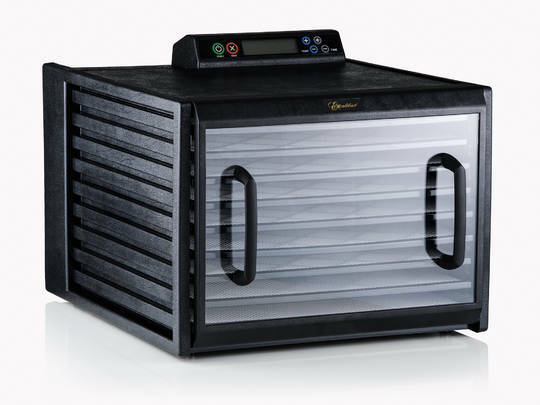 Excalibur dehydrators are economic, saving your electricity costs. 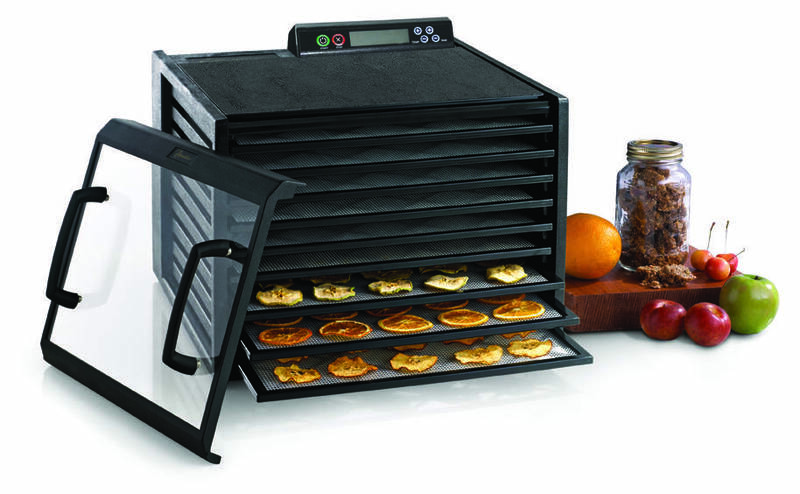 Fruit and vegetable drying is fast and easy. Fish and other meat dried in four to six hours. Prepares very tasty fruit rolls and cakes. Equipped with a yoghurt-making unit. Removes excessive salt and volume substitutes. 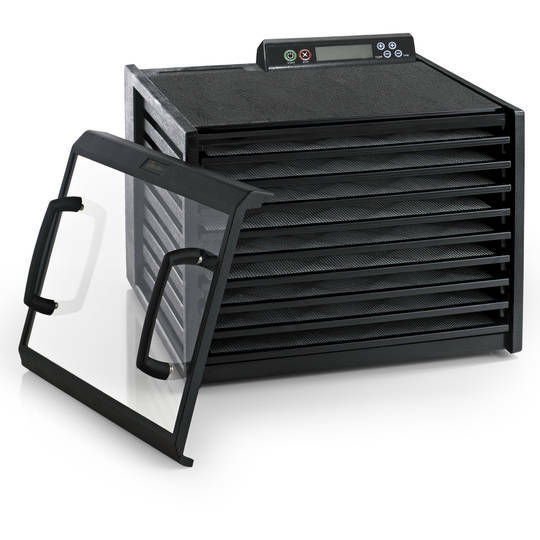 Can you please let me know what would be the exact shipping weight and dimensions of the dehydrator once packaged in its shipping box? Also what would be the shipping/delivery time to an address in Rome, Italy, from the date the order is placed and the payment made? The shipping weight is 10.5 kg. I cannot give the exact dimensions of the carton, as our dehydrators are kept in a warehouse which in in a different location from our offices. However, the approximate dimensions are 40 x 48 x 53. Shipping times will vary depending on the courier (UPS, DHL, or TNT), but should arrive within a week of payment confirmation. It ships out from our central warehouse in the Czech Republic. Replacement tIMER 220-240V for Excalibur dehydrators. Replacement knob for 5 & 9 tray Excalibur dehydrators. Replacement Knob for 4 Tray Dehydrators. 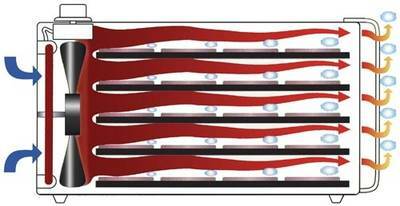 Flexible polyscreen tray inserts prevent foods from sticking, keeps small items from dropping through spaces in trays. Fits all our 5 and 9 tray Excalibur dehydrators. 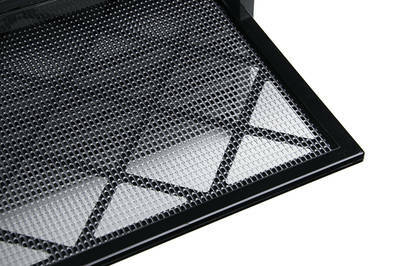 Replacement 15" x 15" trays for your Excalibur 5 and 9 dehydrator. Made from super strong polycarbonate, virtually unbreakable. Transparent door for Excaliburdehydrator with 9 trays.